Daniel has the last say! Theme of the Week - Elton John! 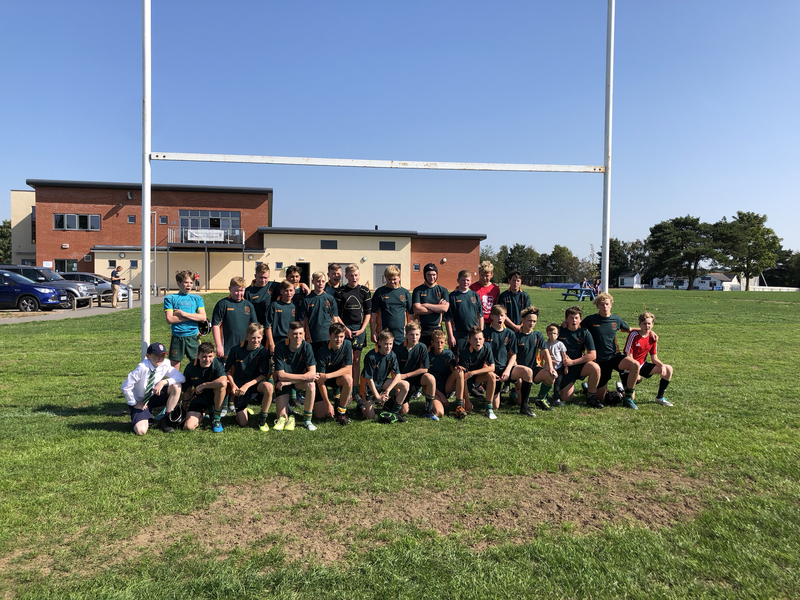 Melbourne U14’s travelled to face a side we hadn’t played before as an age group – Syston, looking at their results this season we knew it would be a difficult game. Syston only had 14 players and so in true rugby spirit we loaned them a rotating Melbourne Player to keep the sides equal. Quinny was back in as Captain and the instruction if he won the toss was to use the advantages of the bright morning and Don’t let the Sun go down on me without testing their backs with some high kicks. It was Melbourne who started the better having received the kick off and passed the ball to Taylor who cut through the Syston defenders like a Rocket Man to score in the corner 0.5 to Melbourne within the first minute. Unfortunately Taylor had pulled up as he scored with an injury and played no further part in the game – we wish Taylor a speedy recovery and this highlights the importance of warming up properly. Syston soon hit back and showed their cards with the ball frequently getting into the hands of their huge number 8 who was a handful all game with strong runs and speed to match – wish we had asked him his name but let’s just refer to him from now on in this report as Daniel. Daniel eventually bulldozed his way over the try line to score under the posts to take Syston into a 7.5 lead. Syston in their nice Navy Shirts – I guess that’s why they call them The Blue’s showed they had more to their game than just Daniel and his aggressive runs and increased their lead when they scored again following some nice interplay – the conversion was missed but now they led 12.5. The Melbourne Boys worked hard in defence and started to force turnovers – special mentions to Brad, Archie, Joe and Quinny for relentless tackling all morning. These tackles and contact areas didn’t come without consequences and Joanne was busy all morning with her Healing Hands trying to get boys back on the pitch. Melbourne levelled the score after some good runs from Sam and Frankie forcing an overlap and Jenko was on hand to head towards the corner to score – only to be taken out by a high tackle and the referee issued a Penalty Try – a debate between coaches, players and the referee started about if a Conversion was necessary following a Penalty Try – James wasn’t sure – but then again he wasn’t sure of much on Sunday morning – Luckily we had Elton John on the touchline – Sorry John Alton on the touchline who got his IRB/ RFU Law book out and confirmed the Penalty Try 2018 Law Change and 7 points were issued – 12.12 and half time. The second half was very similar – Syston attacking especially from Daniel – Brad tackling him – Brad Coming off for a minute or Two for treatment before saying I’m Still Standing and getting back on the pitch to tackle Daniel again. Melbourne did take the lead against the run of play, a nice blind side break by Tiny Dancer – Tom Eagan and Joe Lucas and then great vision by Joe to pick out Josh Pearch to score under the posts to give Melbourne a 12:19 lead. Melbourne were unlucky not to increase their lead when Frankie Thompson broke through the defence and dived to score in the corner, the referee judged that he had dropped the ball over the try line but Chris Eagan with his new Nikita Camera set to action mode picked up the whole try scoring sequence and it was clearly a try!! We tried to reference in John’s Law Book about going to the Video Ref but unfortunately there was no swaying the referee on this occasion and the scored remained 12:19. Syston came back strong and put Melbourne under immense pressure during the last ten minutes with another try by Daniel to level the score at 19.19. The players were adamant that Daniel hadn’t grounded the ball and Chris checked on his Nikita camera again and could show no evidence that the try couldn’t stand. Another debate about the actual score with the referee but John confirmed with accuracy the score and minutes of the score so we went into the last few minutes heading for a drawn fixture. A quick chat before the kick off to say to the boys about possession of the ball and keeping things simple and Don’t go breaking my Heart with anything stupid – “We wouldn’t if we tried” was the less than convincing reply. A turnover in midfield resulted in a final foray of attack on the Melbourne try line and I’m not exactly sure who scored but to make the day Your Song – Daniel it would only be right to think that you scored the winning try for Syston – 24.19. A great day for rugby, two well matched teams with rugby being the winner and thankyou to Syston for your hospitality. Man of the Match for Melbourne was Brad at Full Back for the “Sacrifice”he made to his own body for tackling Daniel – Special Mention to Joe & Archie – a game for tacklers.